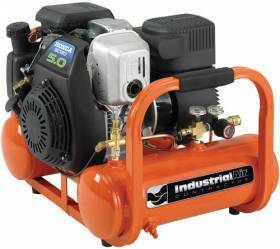 Ideally, when the need for an air compressor presents itself you hook it up to a source of electrical energy and do the job you need to. Sometimes however, you just don’t have that convenience. For instance, those who live on a farm or have a massive backyard will have a problem with their compressor. This is because you often require the use of multiple extension cords which is something I believe should be avoided at all costs due to safety. Generally, on a farm you won’t be able to park a tractor right outside your window where the compressor is connected just so you can inflate the tires. In this case you’ll need a unit that’s gas-powered, and that’s where the compressor I’m about to review comes in. The unit in question is the Industrial Air Contractor CTA5090412 4-Gallon Grade Direct Drive Pontoon Air Compressor which has a Honda Engine. Manufactured by MAT Industries this compressor is, for me, one of the more interesting models on my website. The 5.0hp Honda OHC/OHV gas engine features a direct drive, and oil-free pump with a patented two-piece cooling system which is there to prolong the life of the pump and the compressor itself. The motor delivers a maximum pressure of 155 PSI, or 5.0 CFM and 90 PSI as well as 6.9 CFM at 40 PSI. It also has twin-stack 2-gallon tanks in case you need the extra pressure. Let’s take a closer look at each of these features. At the core of this unit is a 5.0hp Honda GC190 engine which excels with start-ups. Smooth operation and low fuel consumption is something you might expect from a Honda engine and this one is no exception. The 2-piece cooling system I mentioned is capable of keeping the operating temperatures low which extends the life of the compressor. 5.0 CFM at 90 PSI makes this compressor capable of powering most tools, so for instance you can attach more than one nail gun at the same time. Twin tanks are a better option than a single tank, (in this case because of the better weight distribution) which is important since you’ll probably be carrying the compressor around a lot. Mind you, at 74lbs this is not among the lightest compressors on the market, but you have to take into account that gas compressors are heavier than their electric counterparts of the same capacity. This unit is pretty sturdy, but it has some other things going for it as well. Excess moisture is often the issue with air compressors, so this particular model comes with an easily accessible drain valve. There is also a regulator as well as gauges which inform you about all the crucial aspects of operation, while at the same time demonstrating the dedication of the manufacturer because none of the little details have been overlooked. The compressor has a quick connect mechanism that allows you to attach an air hose to it without much fuss. Keep in mind this model does not come with an air hose or any of the usual attachments, so you will have to buy them separately. This handy gas air compressor is pretty high on my list of portable units. In fact, I was hard pressed to find anything negative so say about it. It is a bit pricey, but you pay for the extra portability. Plus, the motor is excellent which isn’t surprising considering its Honda. The manufacturer clearly believes in their own product because they offer a 2-year warranty, and the performance figures are pretty great. Those of you who wish to buy it should visit Amazon, which always offers some great deals on prices.